All work and equipment surfaces are independently height adjustable in 5/8" increments. 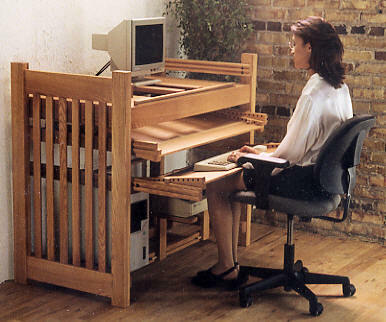 Our desks will fit anyone, of any size, at any age, with no exceptions. 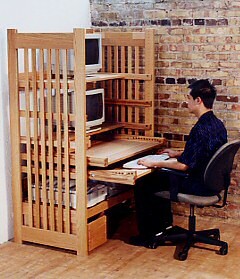 3 ergonomic sizes: 34", 44" & 54"
Wood Craft of Michigan designs, builds and sells adjustable wood computer workstations. We are not an importer or reseller. 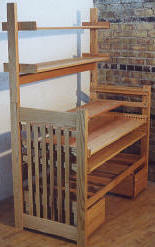 Manufacturing in limited quantities, we use the best grades of Northern Red Oak. We sell our office and home computer furniture factory direct, and ship via UPS, saving you about 1/2 of retail store prices. Modular construction allows our customers to configure our ergonomic office furniture to their exact requirements, without buying "extras" they don't need. Accessories can be retrofit as requirements change. Your 'Nomic Station home computer furniture, will never become obsolete, even when used as a student desk. Using a computer placed on non adjustable home computer furniture, can result in neck, wrist, back or eye pain. Repetitive Strain Injuries can result, including tendonitis and Carpal Tunnel Syndrome. 'Nomic Station ergonomic office furniture addresses these issues with the ultimate, adjustable, solid hard wood solution. Our student desk and computer workstations rock steady worksurfaces pull in and out, adjust up and down, and tilt forwards or backwards. Our adjustable desk allows the user to position their monitor and keyboard at an ideal height, angle and distance from them to eliminate strain & pain. Your equipment and worksurfaces are arranged in a vertical stack on our oak wood computer desks, so everything is easy to reach. And because the work surfaces pull out, the user can sit in any kind of chair, or stand up. This is a wonderful computer desk.... terrific for short folk like me. [Model 33E] I can see though, with such a great design, it really would be a boon for tall people as well. I've changed some of the shelving configuration, and I'm wondering if you can send me extra slats for the printer shelf. Because everything is a little tight, I've put my printer elsewhere (no problem) and I'd like to use the printer shelf for other storage that requires a more solid surface. It looks like 5 slats will probably do it; just let me know if you can do that, and what you'd charge. Thanks for your thoughtful directions too. It became for me a good exercise in really reading carefully, and then I was off and running, having fun - so nice to handle lovely wood that fit together as stated, with strong, simple hardware. I feel fortunate indeed to have come upon your website! I just came across your website after many years. I am going on ten years now since I ordered my desk from you. I am typing this email on it. I love the desk. It is solid and has kept up with my ever changing needs. When I ordered I had one small monitor, today the standard is two 22” LCD’s. My desk has no problem accommodating the changes. I have all my peripherals handy, too. I still make adjustments as needed from time to time. Having the flexibility to adjust the height of the surfaces is such a luxury. Thanks again for building such a great computer desk.